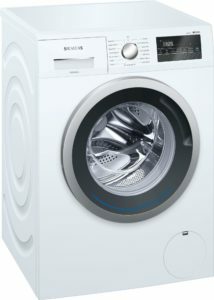 iSensoric Washing Machine with iQDrive for highly effective and efficient laundry care. Speed up the washing process by up to 65% with the varioSpeed option. High-grade stainless steel drum for 1-8 kg loads. Textile guard re-proofing programme for gentle waterproofing of outdoor textiles. Hi, what mean error F23 on the display? Fault F23 indicates the anti flood device in the machine has been activated. The water in the sump of the washing machine. Hi Per, error E80 means: Fault in drive circuit electronics detected. Solutions from Siemens: Faults can only be eliminated by an experienced engineer. We recommend contacting customer service. Hallo, what is CL on the display? Hallo, CL means Child Lock. Try to push and hold Start button for few seconds. My machine say ‘yes’ in display(after I turn to rinse), what is this means?